January is National Learn to Ski and Snowboard Month, and we made a New Year’s resolution to do just that. On Friday morning, we bundled up and drove to Shawnee Mountain for a giant group lesson. We rented equipment, learned the basics, and detailed the whole process—including what to wear and what to bring—on Facebook Live. We also shared some footage on Snapchat. Check out our story for snaps from the slopes! What is the World’s Largest Ski Lesson? It’s the country-wide kickoff to Learn to Ski and Snowboard Month. Each year, ski areas across the US join forces to challenge Guinness World Records for the Largest Ski and Snowboard Lessons Ever Taught. This year Canada jumped in on the cause. Approximately 80 ski areas across seven time zones hosted simultaneous ski lessons on January 6, 2017. In the Pocono Mountains, the fun began at 1 p.m. 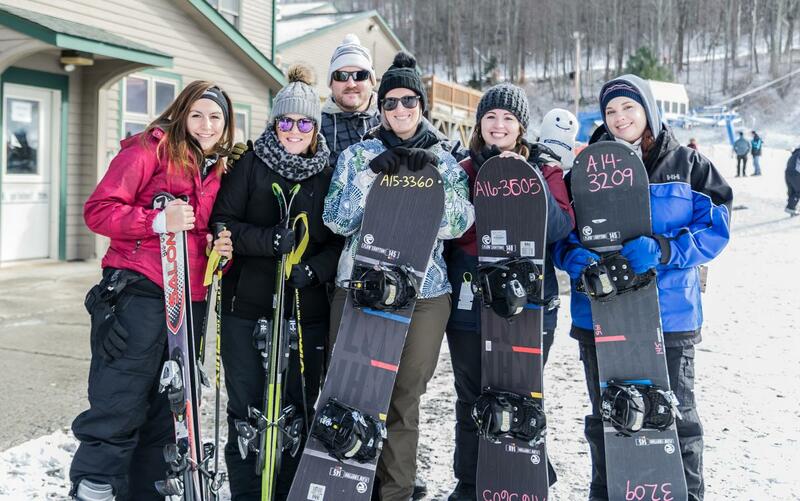 The World’s Largest Ski Lesson is presented by the organizers of the Learn to Ski and Snowboard Initiative, the National Ski Areas Association, and other national, state, and regional associations. For more information, visit skiandsnowboardmonth.com. Couldn&apos;t make it this time around? There&apos;s always next year. And “learn to” incentives are available at our ski areas all month long! Browse Pocono Mountains Ski and Stay Packages, Ski Season Events, and Ski Specials to plan your winter adventure. Check back soon to see whether or not we reached our goal! Here are some tips on how to dress for your first time skiing, snowboarding, or snow tubing in the Pocono Mountains.